An air brake or, more formally, a compressed air brake system, is a type of friction brake for vehicles in which compressed air pressing on a piston is used to apply the pressure to the brake pad needed to stop the vehicle. Air brakes are used in large heavy vehicles, particularly those having multiple trailers which must be linked into the brake system, such as trucks, buses, trailers, and semi-trailers, in addition to their use in railroad trains. George Westinghouse first developed air brakes for use in railway service. He patented a safer air brake on March 5, 1872. Westinghouse made numerous alterations to improve his air pressured brake invention, which led to various forms of the automatic brake. In the early 20th century, after its advantages were proven in railway use, it was adopted by manufacturers of trucks and heavy road vehicles. Air brake systems are typically used on heavy trucks and buses. The system consists of service brakes, parking brakes, a control pedal, and an air storage tank. For the parking brake, there is a disc or drum arrangement which is designed to be held in the 'applied' position by spring pressure. Air pressure must be produced to release these "spring brake" parking brakes. For the service brakes (the ones used while driving for slowing or stopping) to be applied, the brake pedal is pushed, routing the air under pressure (approx 100–120 psi or 690–830 kPa or 6.89–8.27 bar) to the brake chamber, causing the brake to be engaged. 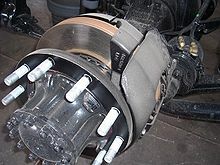 Most types of truck air brakes are drum brakes, though there is an increasing trend towards the use of disc brakes. The air compressor draws filtered air from the atmosphere and forces it into high-pressure reservoirs at around 120 psi (830 kPa; 8.3 bar). Most heavy vehicles have a gauge within the driver's view, indicating the availability of air pressure for safe vehicle operation, often including warning tones or lights. A mechanical "wig wag" that automatically drops down into the driver's field of vision when the pressure drops below a certain point is also common. Setting of the parking/emergency brake releases the pressurized air in the lines between the compressed air storage tank and the brakes, thus allowing the spring actuated parking brake to engage. A sudden loss of air pressure would result in full spring brake pressure immediately. A compressed air brake system is divided into a supply system and a control system. The supply system compresses, stores and supplies high-pressure air to the control system as well as to additional air operated auxiliary truck systems (gearbox shift control, clutch pedal air assistance servo, etc.). Highly simplified air brake diagram on a commercial road vehicle (does not show all air reservoirs and all applicable air valves). The air compressor is driven by the engine either by crankshaft pulley via a belt or directly from the engine timing gears. It is lubricated and cooled by the engine lubrication and cooling systems. Compressed air is first routed through a cooling coil and into an air dryer which removes moisture and oil impurities and also may include a pressure regulator, safety valve and smaller purge reservoir. As an alternative to the air dryer, the supply system can be equipped with an anti-freeze device and oil separator. The compressed air is then stored in a supply reservoir (also called a wet tank) from which it is then distributed via a four-way protection valve into the primary reservoir (rear brake reservoir) and the secondary reservoir (front/trailer brake reservoir), a parking brake reservoir, and an auxiliary air supply distribution point. The system also includes various check, pressure limiting, drain and safety valves. Air brake systems may include a wig wag device which deploys to warn the driver if the system air pressure drops too low. The control system is further divided into two service brake circuits, the parking brake circuit, and the trailer brake circuit. The dual service brake circuits are further split into front and rear wheel circuits which receive compressed air from their individual reservoirs for added safety in case of an air leak. The service brakes are applied by means of a brake pedal air valve which regulates both circuits. The parking brake is the air operated spring brake type where its applied by spring force in the spring brake cylinder and released by compressed air via a hand control valve. The trailer brake consists of a direct two line system: the supply line (marked red) and the separate control or service line (marked blue). The supply line receives air from the prime mover park brake air tank via a park brake relay valve and the control line is regulated via the trailer brake relay valve. The operating signals for the relay are provided by the prime mover brake pedal air valve, trailer service brake hand control (subject to local heavy vehicle legislation) and the prime mover park brake hand control. The supply of air is unlimited, so the brake system can never run out of its operating fluid, as hydraulic brakes can. Minor leaks do not result in brake failures. Air line couplings are easier to attach and detach than hydraulic lines; the risk of air getting into hydraulic fluid is eliminated, as is the need to bleed brakes when they are serviced. Air brake circuits on trailers can be easily attached and removed. Air not only serves as a fluid for transmission of force, but also stores potential energy as it is compressed, so it can serve to control the force applied; hydraulic fluid is nearly incompressible. Air brake systems include an air tank that stores sufficient energy to stop the vehicle if the compressor fails. Air brakes are effective even with considerable leakage, so an air brake system can be designed with sufficient "fail-safe" capacity to stop the vehicle safely even when leaking. Air brakes generally cost more. Air brake systems compress air, which results in moisture that requires air dryers to remove, which also increases the price for air brake systems and can contribute to higher maintenance and repair costs, particularly in the first five years. In the U.S. drivers are required to obtain additional training and licensing, known as an “endorsement,” in order to legally drive any vehicle using an air brake system. The Federal Motor Carrier Safety Administration (FMCSA), which regulates the trucking industry in the U.S., requires that drivers who operate a vehicle equipped with air brakes take their driving test in one. Learning to operate air brakes smoothly has a learning curve, as they are difficult to operate smoothly. Also, since air brakes must be operated differently from hydraulic systems, driving a vehicle with air brakes requires knowledge of proper maintenance. A driver is required to inspect the air pressurization system prior to driving and make sure all tanks are in working order. ^ Bennett, Sean (2010). Heavy Duty Truck Systems, 5th Ed. USA: Cengage Learning. p. 907. ISBN 1435483820. ^ a b c Lyden, Sean. "Air Brakes or Hydraulic Brakes?". www.worktruckonline.com. ^ Driving Commercial Vehicles: A Guide for Professional Drivers; page 1; ICBC; 2016; accessed 27 March 2019. Tractor Protection Systems. North American Standard Inspection Program, Commercial Vehicle Safety Alliance (May 19, 2010).